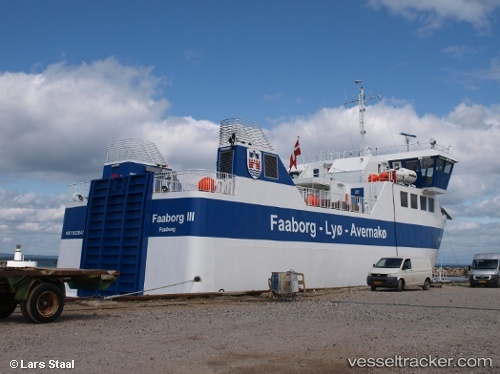 The "Faaborg III" returned on the Faaborg - Lyø - Avernakø route again in the morning of Apr 12 after the ferry was hit by an engine failure only a few days after it had returned to the route following a major service inspection. The repair had been carried out at the Faaborg ferry terminal. The smaller "Sydfyn" had served as a replacement ferry in the meantime, but safety rules made it necessary to cancel some evening departures on Apr 10, 11 and 12. The "Faaborg III" had to cancel its sailings from Faaborg to Lyo and Avernakø on Apr 11 and 12, 2017, after pistons in the port engine smashed in the night of Apr 10, and therefore the ship has to undergo major repairs. She remained sidelined in Faaborg for that purpose. The ferry "Frigg Sydfyn" was inserted as a replacement the same evening, but both on Apr 11 and Apr 12 the 6 p.m. departure had to be cancelled due to a lack of manpower to serve the whole schedule. The last chance to reach Lyo and Avernakø from Faaborg was at 4 p.m. The "Faaborg III" had been in dock for overhauls from March 20-31. The "Faaborg III" had to be sidelined in Faaborg for an indefinite time on July 30, 2014, due to a technical malfunction. The ferry service from Faaborg to Avernakø and Lyø was suspended. One of the propellers could not be controlled - apparently it drove at full speed all the time. Technicians from Esbjerg was called to rectify the damage, but due to a lack of spare parts which had to be ordered from Holland and driven to Fyn the replacement of electrical and electronical components could not yet be carried out. The "Catrine K" was inserted as a replacement ferry, but also had to be taken out of service due to problems with a diesel tank.